Temperature accuracy is ± 0.4 °C and humidity is accurate to ± 4% below 80%. The sensor is tested in a precisely controlled environment at a fixed temperature and humidity to pass quality control. The WEATHERmeter's temperature and humidity sensor can take a little time to adapt to environment changes, e.g. moving from indoors at 68° F and 40% relative humidity to outside at 90° and 70% relative humidity. If the meter is carried in a pocket - body heat will warm the device and internal sensors. The acclimation period can vary from 1 to 15 minutes depending on airflow over the meter and the magnitude of the differences in ambient air temperatures and moisture content. The more air circulation through the vents the faster the sensors become accustomed to ambient conditions. To help facilitate acclimation, the device can be swung through the air using the key-chain attachment and a lanyard. Do not blow warm, moist air into the vents. Temperature and humidity readings are best taken in the shade, out of direct sunlight and about 5 ft above the ground. Before taking an observation, it is recommended to place the meter out in the open air out of the sun and away from artificial heat sources & sinks for at least 10 minutes. Atmospheric pressure accuracy is ± 0.03 inHg (±1 millibar). The WEATHERmeter measures atmospheric pressure or 'station pressure'. Sea level pressure, which is reported by most weather stations, is a correction calculation that standardizes the atmospheric pressure measurement to sea level. Pressure decreases at higher altitudes. For example, if you're standing on top of a tall mountain you are going to get a very low atmospheric or 'station pressure' reading - you could get a similar low pressure reading in the eye of a hurricane. For weather forecasting purposes, this value is not very helpful so, it is corrected to a sea level pressure which helps depict where relative high and low pressures are present at the surface. Weather stations and forecasts from the National Weather Service report sea level pressure. A sea level pressure calculation is on the road-map for the Wind & Weather Meter app. Average temperature for the column of air above you would be discerned based on the temperature reading taken by the WeatherMeter and a standard lapse rate. The app will also need to know the correct elevation above sea level of the meter at the time of the reading. Note, you may need to convert your units. Anemometer accuracy is ± 0.5%. Each WINDmeter and WEATHERmeter is individually tested before leaving the factory. 1. Double-check that you have the units properly set. For example, if you prefer mph or knots but have the Settings to m/s, winds will appear to report at roughly half of what you expect. 2. Ensure that you've oriented the Weather Meter correctly. The WEATHERmeter should point into the wind and should be held up as high as possible. Holding the device behind, in front of, or even next to your body or another large object can create wind shadowing that results in lower wind speeds being recorded. 3. Stand in an open, unobstructed area when taking readings. Standing next to a building or structure, beneath a tree, etc., could easily result in lower wind readings. Note: The actual wind speed is often much less than the perceived wind speed. For instance, wind speed is a measurement of how far a given mass of air travels over a given time period. So, wind speeds are always averages (even if other anemometer devices claim otherwise). It may be that the perceived wind speed is more in line with the wind gust, which is the maximum recorded wind speed over a given period. Weather stations near you might read differently for several reasons. First, recall that wind speed and direction can vary greatly only short distances apart. For instance, the winds on the beach and the winds on the water can vary substantially. So, is the fixed weather station really representative of the winds that you are measuring with your WEATHERmeter? Second, remember that weather stations themselves may have varying degrees of accuracy. Is the anemometer for that weather station well-calibrated and well-sited? Is it reporting the same wind speed units as your WEATHERmeter? Oftentimes, fixed anemometers will be sited at an elevation of roughly 10 m (33 feet). Hence, it is very likely to record higher wind speeds as the accompanying graphic indicates. Wind speed decreases the closer to ground you are, even when you have a clean fetch upwind of you. This decrease is due to aerodynamic forces between the air and the ground. 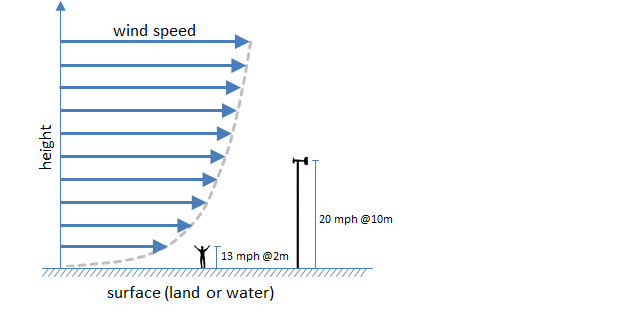 That means wind speed at 10 meters off the ground (where most anemometers are sited) is significantly higher than the wind speed at 2 meters (where you normally hold the weather meter). Our human brains automatically calibrate to this phenomenon, and any handheld weather meter will seem to read low. But it's completely normal for a handheld weather meter on the beach to read significantly lower than what your experiences over water (or what nearby weather stations may report). For notes on taking accurate wind direction readings, see this page. In you still feel your WEATHERmeter readings are incorrect, please follow this link for WEATHERmeter Troubleshooting. If this doesn't help, please Contact Us with specific details regarding what is happening, where you are, what mobile device you're using, and so on. Then we can further examine your issue.